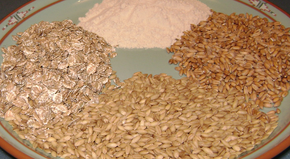 Gluten (frae Laitin gluten, "glue") is a composite o storage proteins termed prolamins an glutelins that is stored thegither wi stairch in the endosperm (that nourishes the embryonic plant in germination) o various cereal (grass) grains. ↑ Food and Drug Administration (January 2007). "Food Labeling ; Gluten-Free Labeling of Foods" (PDF). This page wis last eeditit on 6 Dizember 2018, at 00:09.